I live in the North of North America…my state of Wisconsin scratches Canada’s expansive belly. And just yesterday it snowed. Oh, did it snow. It snowed, then snowed again, then rained, then snowed, creating a thick, impenetrable shell of ice over all our cars, so that it took about 45 minutes to move my vehicle two inches out into the road. Then it snowed again, and as the docile white flakes drifted down from the icy heavens to our earth, I finally felt that, though it’s the end of December, winter had finally arrived. Some inner-polar bear lives inside people who reside in cold places. Snow is essential to our happiness in winter. I remember I moved tepidly through Christmas, feeling only a few reindeer bells in my heart because it was the temperature of a balmy spring day on the holiday itself. But now that there’s snow…oh, anything can happen! Maybe it doesn’t take tunneling through frozen water and your eyelashes growing heavy with snow to make you feel happy about winter. Maybe just a good glass of beer can do that. For the rest of winter, I’m going to talk about different styles of beers that will warm you up from the inside out. And I’ll start at the beginning of the flavor spectrum…with light beers. But if I am fair, there is much flavor and much story to be gleaned from light beers. They carry clean, summery flavors, and while I’d always prefer to sink deep into the syrupy murk of a stout, light beers are like drinking a ray of sunlight, or a butterfly. Light beer’s essential flavors are able carriers for the classic tastes of winter beer. The classic tastes of winter beer are what you might expect; cinnamon, cloves, nutmeg, oak toastiness, a fireplace, Santa’s beard (ew, gross), presents, good cheer, show, shoveling, and so on. (Actually only the first four are the classic tastes of winter beer). The first beer I’ll endeavor to discuss is the Winter Cheers Hefeweizen from Victory Brewing. Hefeweizen is a wheat beer (hefeweizen literally means ‘yeast wheat’) that is brewed heavily with wheat, compared to a lighter amount of barley, and hefeweizens are characterized by a strong yeast flavor. Don’t let the term ‘yeast flavor’ turn you off…it turns out that yeast tastes like banana and cloves when in a hefeweizen. Because of these flavors, a hefeweizen is a perfect beer to turn wintery. 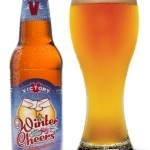 The Winter Cheers brew from Victory Brewing delivers on this, giving cheerful drinkers a beer with spicy hints of banana, clove, and citrus. Witbier, by contrast, is a beer that is brewed mostly with wheat but lacks the heavy yeast flavors of a hefeweizen. Witbier is a grand option if you’re not a fan of beer at all, but have too much self respect to sip any MillerCoors product. 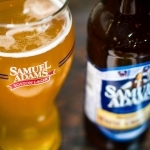 The witbier from Samuel Adams Brewery, aptly called White Christmas is mild and pleasant. It’s a non-confrontational beer with notes of cinnamon, orange peel, and nutmeg, and the majority of Sam Adams beer that I’ve had is non-confrontational. You won’t get memorable flavors from this brewer, but you will have a very nice drink. If you’re wondering why “notes of apple” is mysteriously absent from this article so far, don’t worry a moment longer! Apple flavors are classically “winter”, but I think more craft brewers don’t use apples in the wort because it can bend too close to cider , a popular drink made from apples that can be alcoholic and nonalcoholic. Lately, craft ciders have burst in popularity, and definitive lines get blurred. 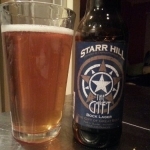 But The Gift, from Starr Hill Brewery is indeed a gift for those of us who have never been to a doctor because we eat so many apples. The Gift is sweet with zingy notes of apple and the green bitter taste of quality hops. After a few sips, the taste of honey spreads throughout the flavor, but apple is the prevailing taste in this helles bock. There are many more light winter beers to discover, and when you find them, get excited, because they’re truly hard to find. Most Christmas or winter beers are ales, stouts, porters, or a particular kind of seasonal beer called a “winter warmer”, which I’ll talk about in the next article. Finding a light Christmas beers in the winter months will be like finding a treasure chest filled with gold, buried in the snow, if you think that light beer is a treasure (again, relevant sidenote, if you care about my opinions: I do not think light beer is a treasure). Remember, good beer can be drunk any time of year. Or maybe this is a fine time to come to the dark side and have stouts and porters be your new favorite drink. I’ll see you at the bar!